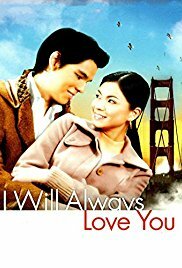 Justin (Richard Gutierrez) is a rich, smart, confident mestizo from a private school in Manila while Cecille (Angel Locsin) is a simple scholar from a rural public school. The two fall for each other against the wishes of his parents, (Jean Garcia and Lloyd Samartino). They want him to marry Donna (Bianca King), their business partner’s daughter. His parents order Justin to study in the States to separate him from Cecille. But Justin finds a way to take her with him to San Francisco without anyone knowing. The young lovers live their dream in America. One day, however, Justin’s mother drops by to visit, bringing Donna with her. Justin hides Cecille with a family friend (Suzette Ranillo). One day, she catches him and Donna in a tight embrace. She takes the first plane back to Manila, ignoring Justin’s attempts to explain why he was kissing Donna. Back home, Cecille’s childhood friend Andrew, (James Blanco) courts her relentlessly. In a few months, Andrew and Cecille are engaged to be married. And then, Justin flies home to try to win Cecille back..